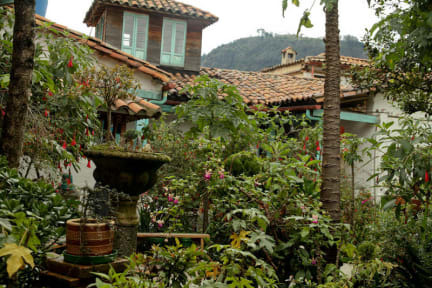 Anandamayi is a very comfortable and inexpensive Hostel & Hotel in the most beautiful colonial house in la Candelaria old town. It has 3 poetic and colourful patios with hammocks and geraniums; a wonderful ancient garden with waterfalls, fish ponds and incredibly friendly hummingbirds; Nice and clean rooms and an attic from where you can see the sunrise behind Private Monserrate and hear the bells from the old churches and cathedral; and at sunset, the martial band when they change the guard at the presidential palace which is just around the corner. Anandamayi can lodge 27 people.' love all, serve all' are it's aims. All museums, theatres and major attractions like the Quinta de Bolivar, Monserrate Sanctuary, the Botero Museum, Gold Museum, Luis Angel Arango library, colonial churches and historical monuments are within walking distance. On week-ends you can join ecological trekking groups that follow the ancient Indian roads: lots of Sun, exercise and beautiful scenery. You can enjoy the super location of this safe and drugs-free place and yet you will be surprised at how quiet it is inside, and how friendly and homely the atmosphere is. Writers, painters and poets often stay for a long time. We stayed a couple of days here and absolutely enjoyed it. 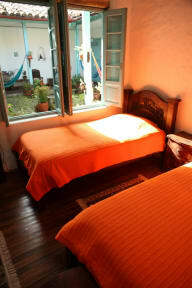 The hostel is so quiet and relaxed, while close to the center and in the nice neighbourhood La Candelaria. The staff was very kind and and a taxi from the hostel to the airport when we left. The including breakfast is good, no option for fruitsalad though. Bathrooms and showers are very spacious and clean. Lots of details and the hammocks in the patio are perfect to relax. Also a beautiful garden in the back.